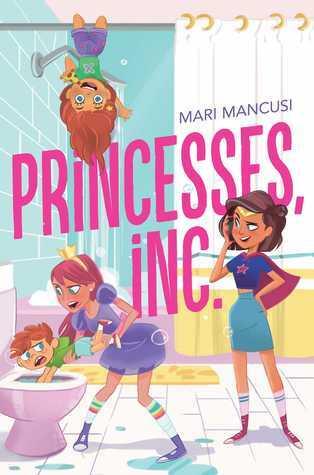 Ms. Yingling Reads: Guy Friday-- Princesses, Inc.
You know, there need to be more books about BOYS babysitting! After all, Keith Robertson's Henry Reed's Babysitting Service came out in 1966! I liked that Breck got some mention in this book, but I would have LOVED to see him take more of an active role in babysitting! Hailey and her friends really, really want to attend ComicCon so that they can meet famous YouTuber Collin Prince. Hailey also really wants to go, hoping that she can enter a writing contest and possibly get into a writing camp. Her story? A fanfic piece on Collin Prince that she and her friend are co-writing. When all of their families agree that it's too expensive, the girls decide to babysit... with the added twist that they will go in princess or pirate costumes and get more jobs that way. This, of course, means costumes and a lot of work, and doesn't always go smoothly. Hailey has the added complication of meeting Breck, who loves video games as much as she does, and whose father is an author. He is very helpful on some of the babysitting gigs, and offers to ask his father to look at Hailey's writing. After a particularly unsuccessful babysitting venture (Only Hailey shows up to a wedding, and has a lot of trouble keeping the triplet flower girls under control. She even has to ask her step sister for help! ), the girls decide to give up, and end up visiting a hospital as princesses, with a surprising result. Strengths: This is actually a really good idea, one which I would have embraced forty years ago when I was getting a whole dollar an hour to watch the entire Fitzgerald family of five children! I'm not sure how much children today babysit, but I always enjoy books about tweens who do something unusual, and this embraces that on several level-- Hailey writes AND she is passionate about videogames and cosplay. Mancusi also wrote the great 2008 Gamer Girl and clearly has a love for the world of ComicCon. The humor is great. Once again, the M!X series does not disappoint. Weaknesses: YouTubers and fan fiction-- two of my own personal least favorite things. I don't really want to encourage readers to explore either of those things, but those who already are will enjoy this. What I really think: Can there be a M!X Book of the Month Club where they just automatically send me all of their titles? That would be fantastic. Kids still babysit (our daughter does) and you'd be surprised how much they get per hour. Ask around and you may quit librarianship and go into full-time babysitting!